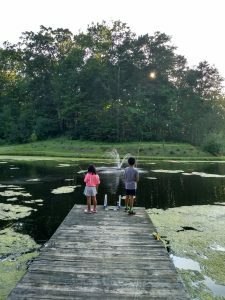 Ethan and Anna fishing off the dock at our hosts house in Kingsville – like visiting old friends! In August we had the wonderful privilege of being back with our friends from First Baptist in Kingsville, OH. This is a smaller church, but they are very dear to us! They are one of the first churches to ever have me in many years ago, and have become friends as we’ve gone back many times. This trip, we took the whole family and stayed at a “magic house” as the kids called it – Dr. Dan and his wife Stevie have the most amazing place with ziplines, goats, secret doors, haywagons, ponds, you name it. The kids could hardly believe it, and they are just wonderful people and wonderful hosts, so it was ministry and a family trip all in one! 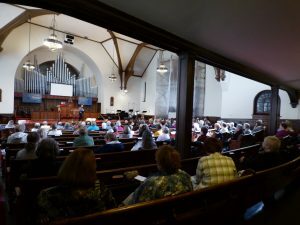 The following week I did a concert at New Albany Presbyterian. This was also a sweet night for me as the music director there is my old high school choir teacher who really had quite a profound impact on the direction of my life. Not only was he an excellent musician which just got me excited about making music, but he was the one who talked me into auditioning for voice in addition to piano, and the rest, as they say, is history. 🙂 It was so fun to be with them! In September I did a women’s retreat for Karl Rd. Baptist Church. I completely re-wrote my women’s conference, “U-Turn: Trusting God When Life Changes Direction” for this one, and boy, did we have many U-Turns on the way to that retreat! It was clear why God had new and different things to say to both those ladies and to me, and I was just marveling at God and all He was teaching us that weekend! In October I had several big weekends in a row. First, I did a retreat for the East Central District of the Missionary Church denomination on the topic “Nothing to Fear.” I’ve been with them before, and they are just lovely to work with! This was, I thought, a very timely topic, both for them and for me – I always learn so much when I’m writing my retreats. Then the next day I stayed and led worship and gave the message on all the services for the host church, Union Chapel. They were outstanding hosts – just served with such a humble heart for Christ during the retreat, and then were just amazing to me. Such a great weekend. 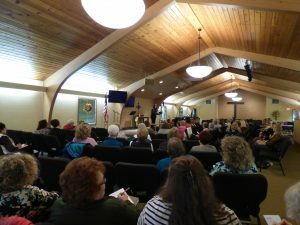 The next weekend I did the Titusville Ladies Conference in Pennsylvania. This conference has been going on for many, many years, and was held in the most beautiful historic church. 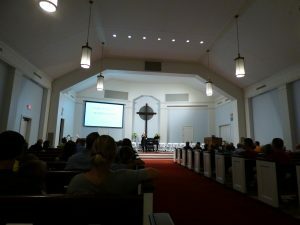 I did a concert and testimony on Friday night and then spoke on the life of Peter on Saturday. This was another lovely team with an especially fun worship team – just loved getting to worship with those ladies! Then the following weekend I did another retreat in Ohio for Christian Fellowship Church on Esther. This was a three day format, so we had a fabulous luxury of time, both to meditate on what God was saying and to rest. What a lovely bunch of women too! Then in the first weekend of November I headed down to Florida to do a women’s event and the services for Anastasia Baptist Church. 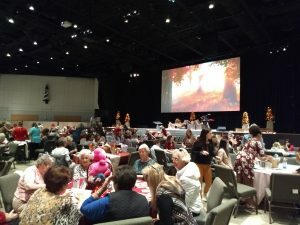 On Saturday they had a big women’s luncheon called “Baskets of Blessing” where everyone brought things to fill baskets they took to women in nursing homes, which I thought was a great way to celebrate Thanksgiving. Then Sunday I sang on all three services. I so appreciate the different teams and the way the services were focused on the Gospel! And on my way home, I got to visit with my cousin who lives in Orlando and designs super-secret fun stuff for Disney, so that was a real treat – I don’t get to see him nearly enough any more! Taking off in a week or so to do several Christmas/Advent events in NY, and then I’m done until next year. We have a pretty big announcement about the spring, so I’m excited for things to get finalized so I can share!! Noah, immediately after open heart surgery, with pink lips, toes, and fingers for the first time. Miraculous. Noah, after recovering, running and playing and laughing, joining the cross country team. Ethan’s stunned and touched reaction to the first time his birthday was ever celebrated in his nine years. Ethan’s sweet heart and amazing patience as he helped his new sister try to figure out how to ask her questions in English. Anna, who had never been able to make the sound “f” or “s” before because of her cleft palate, saying the word “face” correctly after her surgery and looking absolutely shocked and amazed. Anna, singing at the top of her lungs in the shower, “I love my family! I love my family! I love my dad! I love my mom! I love my Toby! I love my Rachel…” and on through all of us. These are just a few moments that still take my breath away when I remember them, and bring tears to my eyes. And when I think of the patience, the persistence, the kindness and openness of my biological kids Rinnah, Rachel, and Toby to widening our family, to bringing others in and making this the new “us,” I am literally so proud I don’t even know how to express it. I have been blessed and blessed and blessed. Adoption is hard. In a perfect world, there would be no adoption because it wouldn’t be necessary. But this world is broken, and there are kids who have had their lives turned upside down by that. They need families. 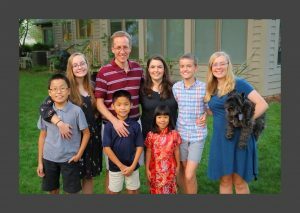 So, on this National Adoption Day, I want to say, this isn’t about me. While it’s been one of the hardest and best things I’ve ever done, this is not about my experience at all – it’s about three kids who have learned what a family is, that they have one forever, and are living into that new reality. It’s about having a front-row seat to redemption, both theirs and mine. It’s about God making all things new. Let’s pray that all children everywhere who need a family get to know that reality too.